DJ's Book Corner: Excommunicated. Saved. Redeemed. 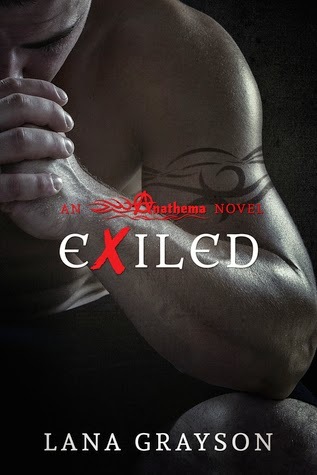 EXILED by @Lana_Grayson, and WIN a Kindle Paperwhite! Excommunicated. Saved. Redeemed. EXILED by @Lana_Grayson, and WIN a Kindle Paperwhite! Exiled from the Anathema MC, Brew Darnell escaped the bullet only to face the unforgiving solitude of the road. With no future before him, Brew battles his past and vows to protect the one he loves the only way he can—by hunting the man who destroyed his family, devastated the Anathema MC, and betrayed every promise he ever made. 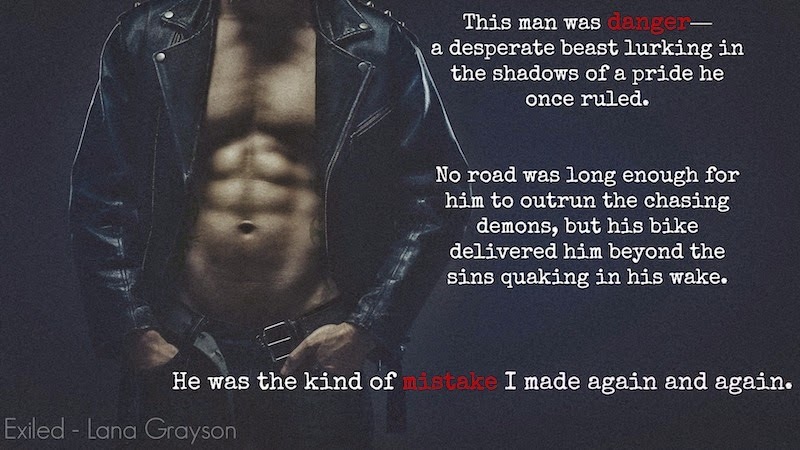 Trapped in an abusive relationship with a sadistic biker, Martini Wright learned to manipulate, controlling her boyfriend’s temper with a wink and a smile until she’s traded as collateral to a rival MC. Her captor, Brew, has never trafficked a woman before, and Martini intends to exploit his guilty secrets to escape. Caught in the middle of a gang war, Brew and Martini fight a dangerous attraction—a second chance to heal from the mistakes of their past if they can confess the terrible truth. Brew failed his family before, but Martini can still be saved. With redemption delivered at the edge of a blade, Brew must choose who to rescue—the one he already lost…or the love he never deserved. Have you ever heard the term “Mary Sue?” It’s a term for a generic heroine—one who is pretty and smart and funny and everyone likes her and she had no discernable flaws. She’s a vehicle for the story and little else, and the character hardly has room to grow within the story as she’s perfect already. Romance novels tend to come down pretty hard on heroines, but it’s the heroes I’d like to examine today. Most readers want to connect with the characters from the first page, if not immediately like the hero from that first introduction. This tends to get a little tricky, especially if the hero is a darker soul, someone who needs to grow and soften as a character before the end of the story. A good hero is redeemable, but he’s not so far gone readers can’t relate to his thoughts and actions. It’s a fine line to walk. As a result, a lot of heroes tend to have the same flaw—arrogance. And that makes sense. An alpha hero relies on his confidence to woo his women, outshine his competition, and fuel his anger when he’s challenged. He thinks himself better/greater/more than the heroine, and is often broken by her stubbornness, beauty, or attitude. However, I like a story where the hero makes mistakes and seeks redemption for past sins. I want to see a man examine his behavior and choices and come to terms with the events that affected others in a profanely negative way. I love to see a strong man broken by his own conscience and then rebuilt through friendships, family, and lovers as well as his own pride and sense of morality. I wrote Exiled to explore just what a terrible revelation from the past would do to my hero’s pride, confidence, and soul, and the result was a whirlwind of emotions and discoveries about the character. I love having the freedom to explore and let my hero make same mistakes of his past, only to redeem himself and learn from the experiences. I want to see more flaws from heroes—tempers, liars, foolishness, greed, etc. Romance is an emotional experience, and I’m always looking for stories where both characters are pushed and forced to grow. If you guys have any recommendations, comment below. I’d love to find some new, exciting romances to read! Lana Grayson was born to write romance. Her favorite genres range from the dark and twisty to the lighthearted and sentimental—as long as the characters are memorable, the story is fun, and the romance is steamy. Lana lives in Pittsburgh with her husband, and, when she isn’t bundled in her writing chair, she’s most likely cheering on the Steelers or searching for the ‘Burgh’s best Italian restaurants.